The Flat Top Grill is good at one thing above all else: feeding people fast. The large 600sq. inch surface area lets you crank out food for 50100 people every hour, so your party will never go hungry. 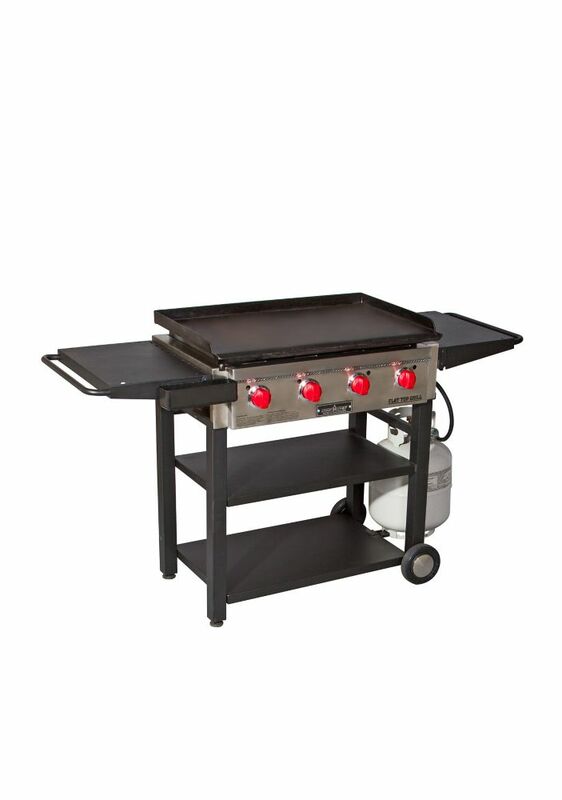 Many propane grills have hot spots, but this grill heats food evenly with its large griddle and a heat dispersing grill design. The thing our customers love most about the Flat Top Grill is the fact that it can be used as a griddle, grill or water pot heat source. Use the griddle for pancakes, bacon, hash browns, sausage, veggies, and even boiling water. Remove the griddle, and you'll find a massive grill underneath to make hamburgers, chicken, steaks, shish kabobs and more. Think of it: breakfast, lunch, and dinner all cooked on the same unit. Designed for a range of heating and cooking needs, Steel Propane Cylinders are perfect for everything from residential grills, outdoor heaters and fireplaces, to commercial and industrial cookers and heaters. Engineered for safety and lightweight strength, they feature a weather-resistant finish and are available in eight sizes. The Broil-Mate<sup></sup> 116454 features a deep, thick oven made from cast aluminium that effectively retains heat and can withstand intense temperatures, best of all it will never rust. The stylish stainless steel lid insert is insulated from direct heat protecting it against discoloration. The sleek and sturdy pedestal base provides long lasting durability that will stand up against the harshest outdoor conditions. The Broil-Mate 116454B features a deep, thick oven made from cast aluminium that effectively retains heat and can withstand intense temperatures, best of all it will never rust. The stylish, black porcelain coated steel lid insert is insulated from direct heat protecting it against discoloration. The sleek and sturdy pedestal base provides long lasting durability that will stand up against the harshest outdoor conditions. Flat Top Grill 600 The Flat Top Grill is good at one thing above all else: feeding people fast. The large 600sq. inch surface area lets you crank out food for 50100 people every hour, so your party will never go hungry. Many propane grills have hot spots, but this grill heats food evenly with its large griddle and a heat dispersing grill design. The thing our customers love most about the Flat Top Grill is the fact that it can be used as a griddle, grill or water pot heat source. Use the griddle for pancakes, bacon, hash browns, sausage, veggies, and even boiling water. Remove the griddle, and you'll find a massive grill underneath to make hamburgers, chicken, steaks, shish kabobs and more. Think of it: breakfast, lunch, and dinner all cooked on the same unit. Flat Top Grill 600 is rated 4.6 out of 5 by 146. Rated 5 out of 5 by Molly from Meets & exceeds expectations. By far the best product of its type out there. Outstanding build qu... Meets & exceeds expectations. By far the best product of its type out there. Outstanding build quality and performance. Rated 5 out of 5 by Robert from Birthday present, even better than I expected!... Birthday present, even better than I expected! Rated 5 out of 5 by griddleman from Much better than my old Blackstone griddle. Camp Chef has better grease management system and a l... Much better than my old Blackstone griddle. Camp Chef has better grease management system and a lot sturdier. Rated 5 out of 5 by Brandon from Cooks great! ... Cooks great! Rated 5 out of 5 by GrillnChill87 from Thing is a beast. You won’t be disappointed. ... Thing is a beast. You won’t be disappointed. Rated 5 out of 5 by Tom from I love it. I finally have a grill that will cook anything. I love it. I finally have a grill that will cook anything.